From the publisher: As the Town's annual flower and produce show approaches, it's all doom and bloom up on the allotments, with prize vegetables going missing and a dead body on Bonny Grub's onion patch. Baronial landowner Fluff Wither-Fork is beside herself and calls in the No. 2 Feline Detective Agency. Who is trying to sabotage the scarecrow competition? And will Hettie Bagshot and her sidekick Tilly get to the bottom of this murky compost heap before judgement day arrives? Amid a sea of binder twine and raised beds, a spiteful killer cat is on the prowl. Who will be next, as the allotment community shake in their wellington boots? Tortie Shorties Review: I love this series so much that I order from the Book Depository in order to receive UK releases long before they hit bookstores here in the US. What makes these books so unique and special is that the entire cast of characters is comprised solely of cats. That's right...in this little world there are no people, just cats. Book me a one way flight, please!!! Each one of the books in this series is more clever and heartwarming than the last. While reading them I find myself completely absorbed in Hettie and Tilly's cozy world; I only wish I could grab a mug of cocoa and join them in purrson. Each kitty has their own unique cat-like personality and the humor is delightfully irreverent. These books are unlike any cat cozy you've ever read, guaranteed! From the publisher: After learning that she comes from a family of witches—and adopting a familiar named Alistair—artist Annabelle Britton has made beautiful Portsmouth, New Hampshire, her home. Together with her coven, this good witch is trying to put a stop to magic and murder most foul. 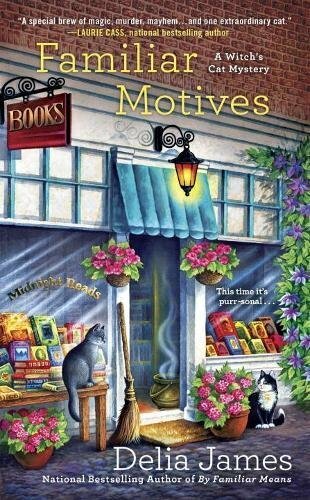 Tortie Shorties Review: This third book in the Witch's Cat mystery series begins as our protagonist Anna is faced with the unenviable task of bringing her cat/familiar Alistair to the vet. Since Alistair has the ability to vanish into thin air - a talent every cat I know would love to have on checkup day - only a witch veterinarian will do, and Dr. Ramona Forsythe is recommended to her by the leader of the coven. While there Anna & Alistair come face to face with the famous K.T. Nibbles spokesfeline Attitude Cat Ruby and Alistair is instantly smitten. They also find themselves in the middle of an altercation between Ramona and two women claiming ownership of Ruby. It doesn't take long before Ramona is dead, Ruby is missing, and the coven faces it's greatest challenge yet as they are forced to separate their witchy powers from the police investigation. Loads of twists and turns culminate in a shocking, life or death motive for murder. If you fangirl on celebrity cats, this one will leave you purring! 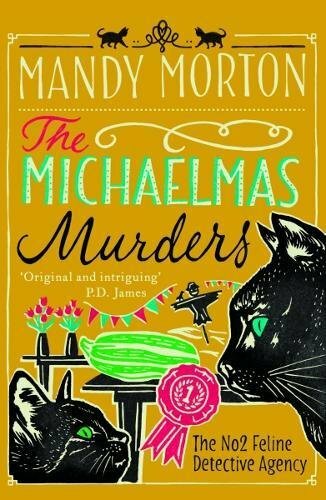 Disclaimer: I bought my copy of The Michaelmas Murders, and received Familiar Motives for free from the publisher in exchange for a fair and honest review. This post contains affiliate links. These two books sound very different and interesting. I know I've said this before, but I always look forward to reading your book reviews. Your choices are always so intriguing and fun, and these two are no different. Thank you for sharing more books for me to add to my to-read list! We love the sound of this! Great review and yet another one to add to Mom's reading list. Thank you! Great reviews, and I love any book that made up of cats! I always love hearing about what books you are perusing Mudpie! Nice review, this sounds interesting. These both sound like interesting reads, Mupdie and Mom Melissa. We always enjoy reading your reviews. We usually end up adding books to our reading list as a result. Michaelmas? But now we're closer to Martinmas...which I know about because it comes in one of the best and oldest songs I know.